Blayney is a small town on the way from Bathurst to Cowra. We had occasion to stop on the way through for lunch, so naturally I sought out a likely looking bakery for a bit of blogging research. We spotted Ryan’s Bakery & Coffee Lounge, and grabbed a table outside despite the 11°C temperature, since we had a newly acquired puppy in tow and couldn’t take advantage of the warm seats indoors. The place had a rustic, country style menu, with a selection of pies the most exotic of which was “bolognese” and a special “sweet chilli chicken”. The woman behind the counter hovered near me as I eyed the selection of cakes and pastries, even following me along the counter as I did my survey to the far end, where I spied what looked like a couple of trays of vanilla slices… except with hot pink icing! I asked the woman if they were vanilla slices, and she said yes. So I considered my order. On a lightning business trip to London, I decided to make the most of my bit of free time by seeking out some sausage rolls here in Old Blighty, the original home of the sausage roll. Near my hotel in Chiswick, there were some bakeries, but they concentrated on bread, cakes, and pastries, with no sign of pies or sausage rolls anywhere. So I took to the Internet, seeking the “best sausage rolls in London”. 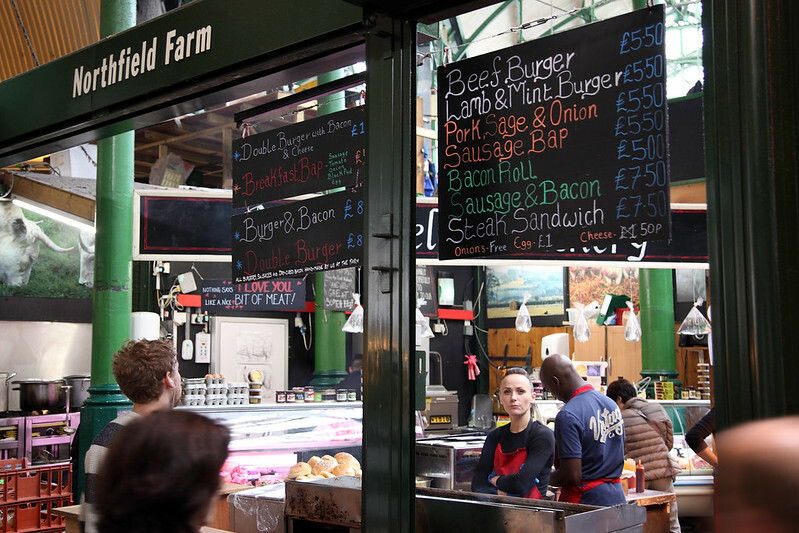 Several list articles mentioned the Borough Market, a lively food market in Southwark, just on the south side of the Thames River from the City of London. I’d been here before, but was happy for an excuse to return. Amidst the sights and smells of this wonderful market, I spotted my first quarry, sitting in a neat pile on a silver tray on the counter of a stall bearing the name of Northfield Farm. These were clearly sausage rolls, but they were obviously cold. The stall mostly appeared to be doing a line in hamburgers, fried sausages in buns, and steak sandwiches, with nary a pie warmer to be seen for heating up the sausage rolls. The Pie in the Sky is a bit of a legendary pie shop, operating for almost 30 years on a site on the old Pacific Highway, a winding two-lane road that used to be the only way to travel north of Sydney before the opening of the F3 freeway. The place is nestled on top of a cliff overlooking the freeway below, and across a vast panorama of eucalypt forest in Ku-ring-gai Chase National Park, across to the Hawkesbury River. 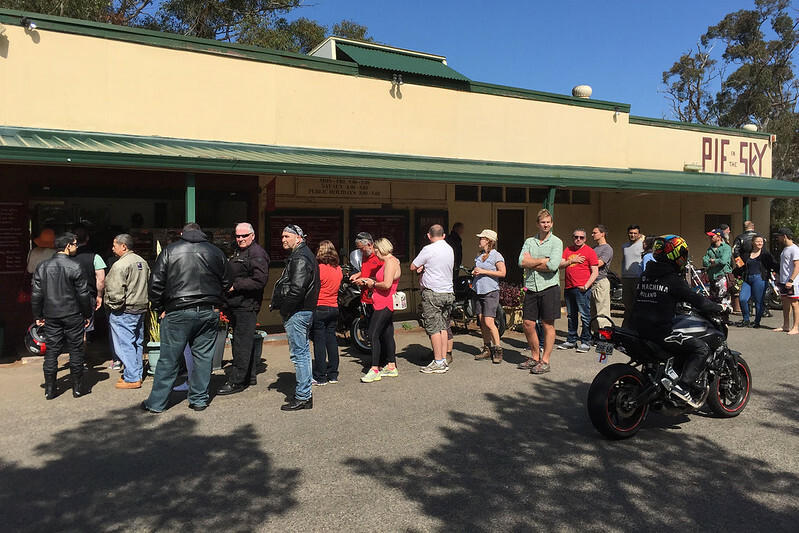 It’s a favourite weekend hangout for motorcycle riders and vintage and sports car drivers, who prefer the scenery and thrills of the old road over the bland freeway. We arrived at lunch time on a Sunday, to find the car park area almost full to overflowing with motorbikes and fancy cars. Fortunately we located a spot that must have just been vacated, and joined the queue, a good 40 people long, to buy our lunch. This place is tucked into a dark corner of the rather sterile courtyard immediately in front of St Leonards railway station. The courtyard contains a bunch of fast food joints and a cafe or two, surrounding a large pool of water which ripples in the gale-like winds that seem to whistle constantly through the ill-designed pedestrian access points. 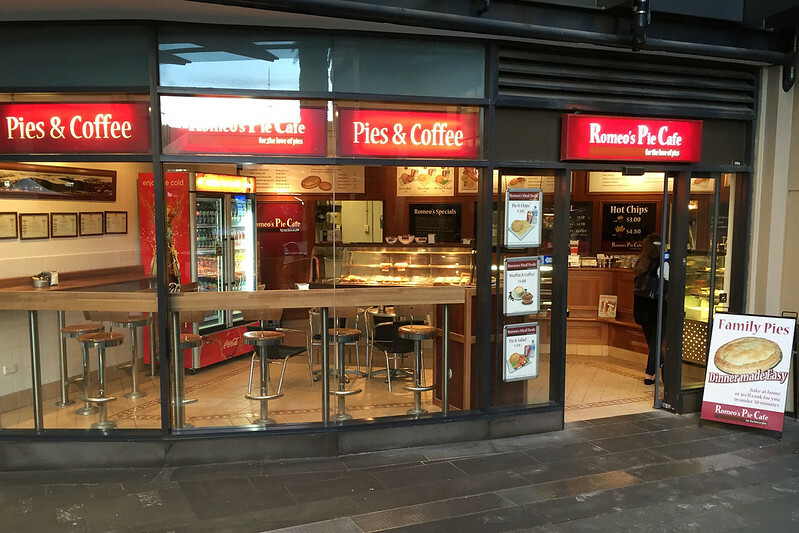 The premises started life as a franchise of the ill-fated Shakespeare’s Pies, a chain which seems to have splintered into various one-off pie shops with names like Halmet’s, Othello’s, and this one, Romeo’s. 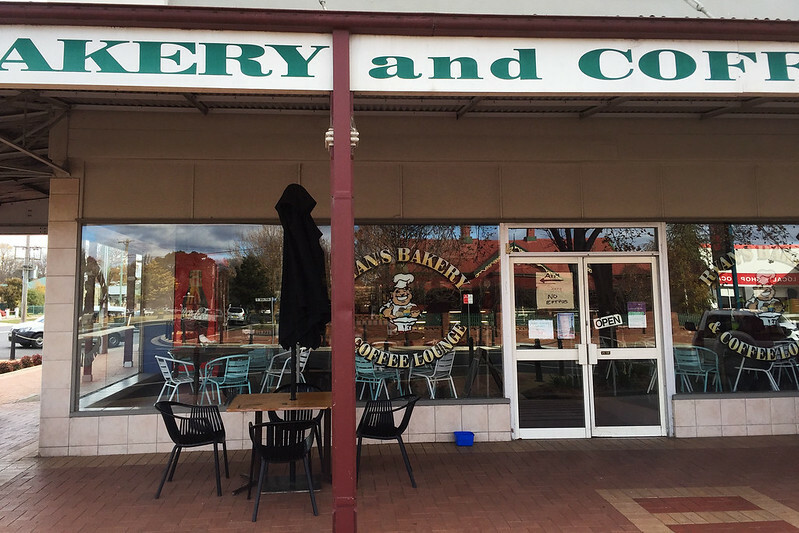 (Spot the theme…) Anyway, they concentrate primarily on pies, but also do a small selection of sweet baked goods like friands and cookies. And of course they do sausage rolls. So there may not be a vanilla slice, but I may as well review the sausage roll. Externally, the roll looks perfectly good, with a golden brown pastry crust and ends of lightly crisped ends of meat showing. It has a little bit of a manufactured feel rather than hand made appearance. It’s served nice and hot and the first bite reveals a passable crust, perhaps a little less flaky then perfect, but certainly not terrible. 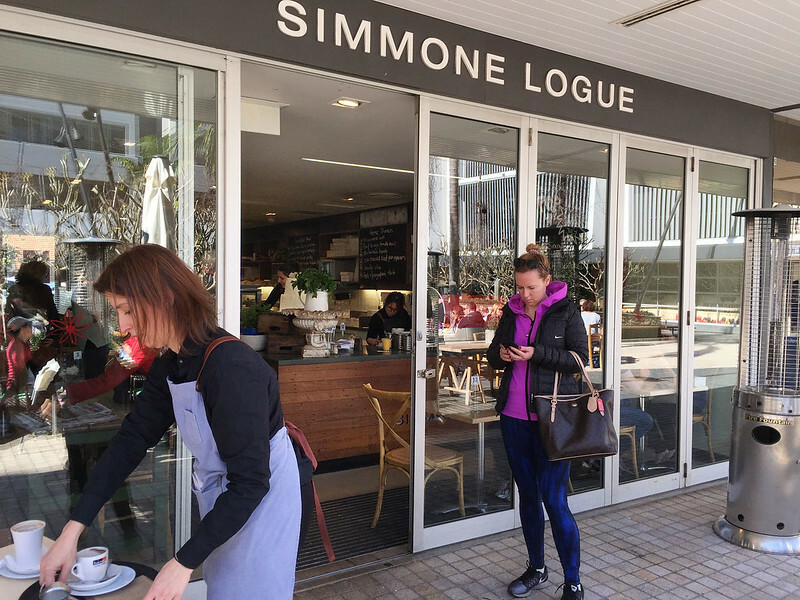 This is one of two stores for the small baking and catering company started by the eponymous Simmone. It’s a trendy upmarket cafe with plenty of mouth-watering goodies, including gourmet salads, savoury pastries, quiches, fancy sandwiches, cakes, tarts, slices, and so on. They also apparently do a dinner service with full cooked meals in the evenings. But I’m here for the sausage roll and vanilla slice. I order them to eat in on one of the chunky rustic wooden tables that looks like you could butcher a side of beef on it. The sausage rolls (as well as the pies) are not kept hot – they are more designed for people to pick up on the way home and reheat at home. But they are happy to heat one up for eating in. While I wait for my order, I admire the country kitchen decorations, including a large set of bookshelves overflowing with well-thumbed recipe books, and vintage French vegetable and flower seed packets in cutesy frames hanging on the wall. It seems these are for sale. 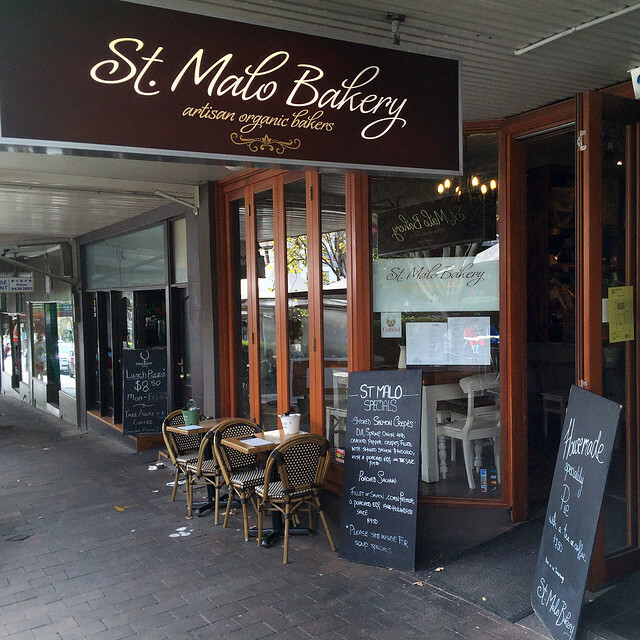 I have wanted to review this bakery since the beginning, but every time I went in they had nothing resembling a vanilla slice in their selection of cakes of the day. Until this day. St Malo is a fancy French bakery which does a line in fresh bread, croissants and other flaky pastries, and beautiful looking cakes and muffins. They also make delicious pies, as well as the other object of this review, sausage rolls. On this day I went in, intending to have a pie for lunch and not expecting to get anything else. But as I looked into the cake display, I saw gleaming there a magnificent shining creation, resplendent in its French elegance. It was three layers of pastry separated by layers of custard, with intriguingly attractive red stains in it, and topped by a sprinkle of ground nuts and a dusting of cocoa. This, I thought, is in essence a vanilla slice. Upon inquiry, I was told that it was a “pistachio and raspberry mille-feuille”. Well, a mille-feuille is basically a vanilla slice, so good enough! I found this bakery cafe for breakfast. 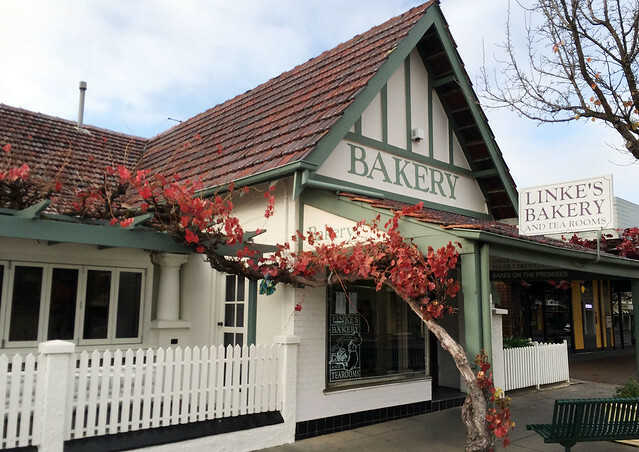 Linke’s Bakery has been operating since 1938, as a small sign inside proclaims proudly. Apparently everyone in Nuriootpa was part of the Linke family back then, because across the road is the Linke Butcher, and around the corner is Linke’s Building and Construction. The bakery does a line in muesli or bacon and eggs and various other breakfast goodies, but I sacrificed the chance for an eggs Benedict to try their sausage roll and vanilla slice. The bakery goods all look really good here, with mouth watering sweet tarts and slices galore, and a full range of hot savoury pies with obviously hand-crimped pastry tops. Given this promising selection, I was looking forward to reviewing the twin quest items.